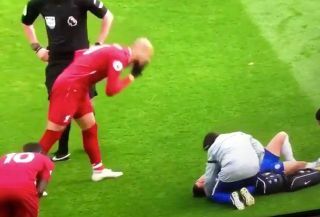 As Eden Hazard lay on the ground in pain, these Chelsea fans spotted Liverpool midfielder Fabinho seemingly do something pretty disgusting. Liverpool dominated the first half at Anfield as they certainly looked the more threatening side in what was a crucial encounter for both teams. After Manchester City’s win over Crystal Palace earlier in the day, the Merseyside giants knew that they had to respond to go back top of the table and pile the pressure back on their Premier League title rivals, and they did so with a 2-0 win. Fabinho was in fine form as he played a key role in Liverpool’s midfield, but this incident had a lot of people talking on Twitter. It appears to show the Brazilian ace clear his nose right next to Hazard, although it has to be said that the camera angle must play a part in this as it looks far too blatant to be true. Further, the referee is standing right next to him and so he would surely have risked a booking or worse if it was intentional. Still, Anfield is a pretty big place and he could have directed it somewhere else as it left the Chelsea fans below less than impressed. Fabinho spits right next to Hazard while he is getting treatment on the floor and no one batters an eye lid. If a Chelsea player did that you wouldn’t hear the end of it..